When you undertake choices in life you often do so with a specific goal. For example when you start running you might want to do a marathon. Or when you start knitting you want to make a jumper. It all can hang on completing things too. Making sure your goal is finished. Have you started the book? Have you finished it. When I started being greener I had a few general goals; grow my own,use less stuff, be more local and be more sustainable. But I also had specific goals. In the garden I wanted to grow courgette flowers as they were delicious but not easy to actually get unless you grew them. I recently started being a forager. 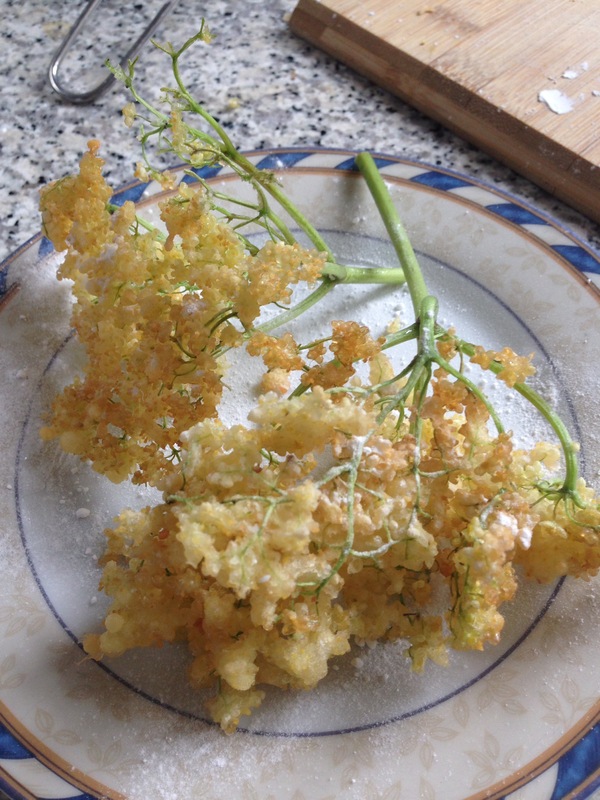 My foraging goal was to eat elderflower tempura. Another thing that isn’t easy to get hold of unless you do it yourself. The first challenge is finding the flowers. The second challenge is having a great walk to go and get them! 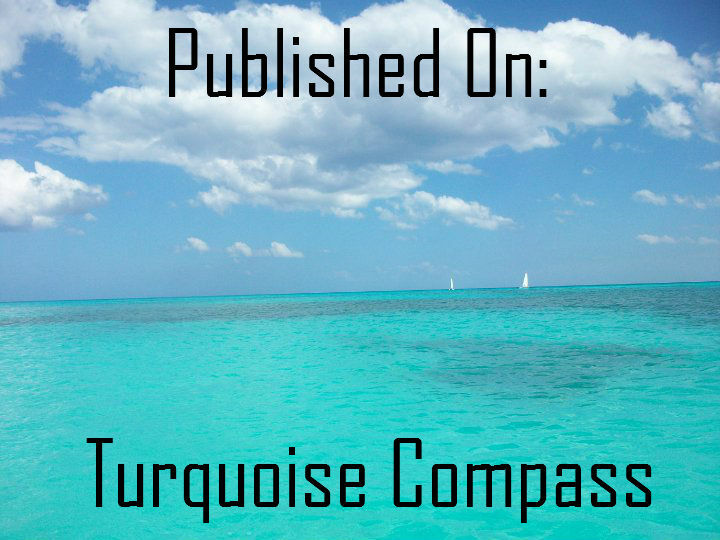 Both conditions were available. And I had to create a recipe for it. The recipes I found said use fizzy water. I didn’t have any. Having picked the flower heads, I was loathe to go looking for some. Then I read that a beer batter could be used. Now I wanted the recipe to be gluten free so decided to use cider instead. Fizzy! Yes! 1. Sieve the flour. I always sieve flour. Add the baking powder, make a well in the middle, and then drop the egg in the well. 2. Using a fork , gently start mixing the egg in. As it gets thicker add some cider. Just a slosh! Add a bit more gradually so that the batter starts to form. Corn flour can be quite dense so watch out for lumps. Add more cider until it’s smooth and quite thin. Give it a whisk or flip with the fork. Dip the flower head petals in the batter. Give it a few moments to drop so it’s not too heavily coated. Heat a couple of cms of oil in a wide pan. When it’s hot enough to get a cube of bread. 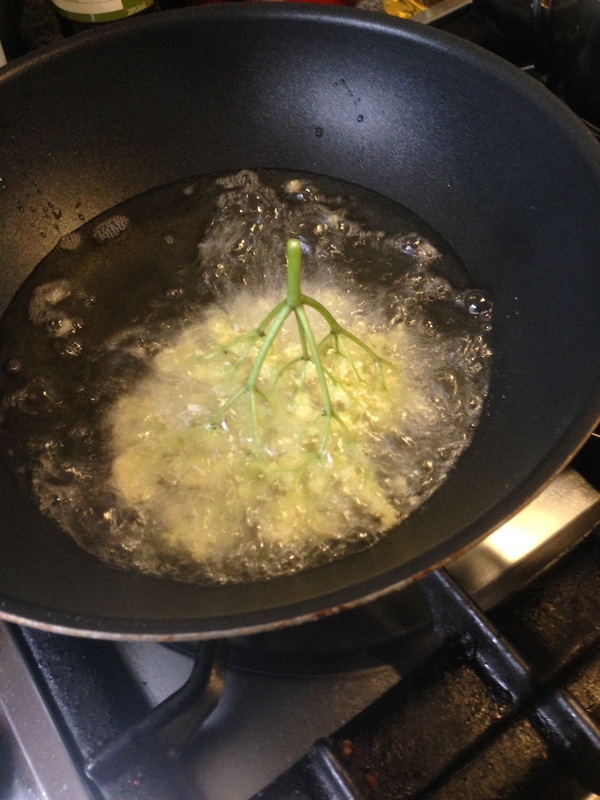 Fry two or three flowers at a time. Apparently it’s good to serve them with elderflower syrup but we didn’t have any handy so icing sugar had to do the trick. This batter would cover a lot more flowers but we didn’t need loads. Probably about 20 heads. What goals have you had on your Eco journey? Did you manage to achieve them? What are ‘couriers flowers’? Never heard of them and nothing comes up google search … ? I began my Eco-journey with an open mind 4 years ago to see what I can develop on dead & sandy construction soil. 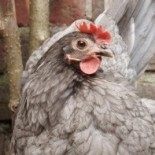 I’ve learned much about compost, season changes, seeds, etc. Now I no longer buy tomatoes, basil, rosemary, pandanus & others. I concede that I can’t be self sufficient but I am able to grow & preserve what nature allows me to. It’s great to explore what’s possible. I also have learned to work with what works. Must look up pandanus! Oooh I’m a big fan of Indonesian foods. Will look into it. Go for it. I was pleasantly surprised! And it’s great that there’s no way to get this unless you make it. I love that. 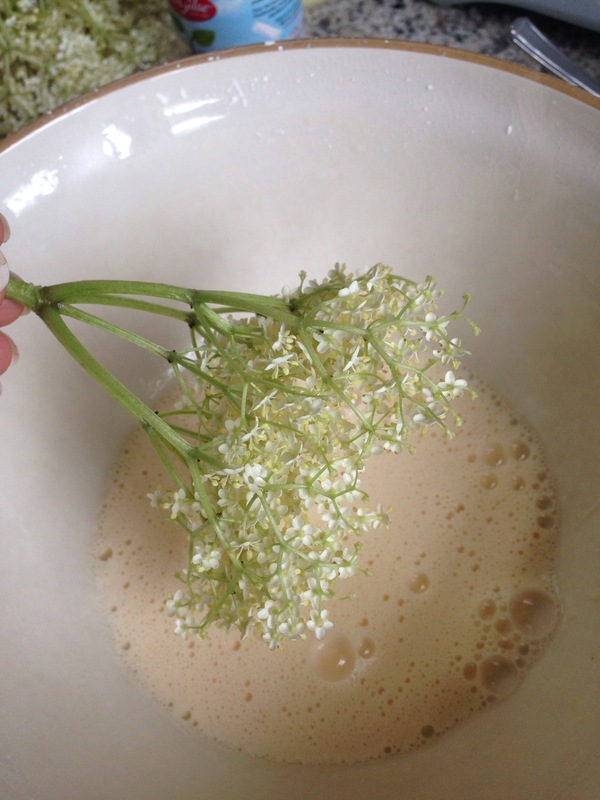 This entry was posted on May 22, 2016 by lizard100 in environment, grow your own, self sufficiency, Uncategorized and tagged cider batter, elderflower, forage, GF.